It seems news travels fast this festive period, as a dog that was cruelly abandoned by its owner just before Christmas has now been offered a home by its unmistakable namesake. CCTV footage captured in Stoke-on-Trent was shared by the RSPCA, which showed a distressed Staffordshire bull terrier jumping up at a car’s doors as its owner began to drive off, seemingly abandoning the dog on the street. Roughly an hour after the incident was recorded, a passerby found the abandoned dog sitting in its bed. The RSPCA were alerted and have since launched an investigation into the situation. The RSPCA staff named the Staffie Snoop, and explained that the dog appeared to have previous owners, who were not the ones responsible for his abandonment shown in the video. He’s currently being cared for at a private boarding kennels where he will get all the care he needs whilst I investigate further. Anyone who recognises the vehicle, the dog or the men in the footage can contact me in complete confidence. It beggars belief that someone could abandon a dog like this at Christmas, but we are so thankful to the kind people who found Snoop sitting sadly in his bed, for taking him to the safety of a vets straight away. 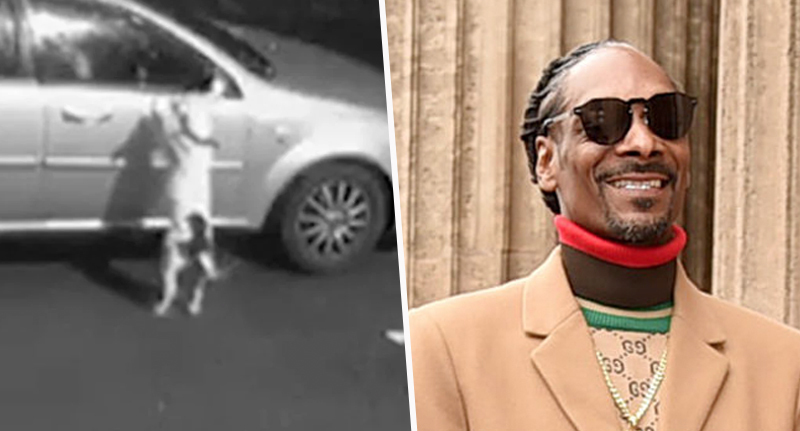 In the search for more information about the dog and its situation, news travelled over the Atlantic and reached none other than Snoop Dogg himself, who was also shocked by the CCTV footage. The rapper even offered to re-home the dog in his LA pad. It is heartbreaking. There is always room for another dog in Casa de Snoop. If he really needed a home then he has one with us. But I don’t think there is going to be any shortage of loving homes after all the exposure he has got. Snoop (the rapper) is of course a well-known dog lover. He launched his own range of Doggfather clothes for dogs in 2006, while he is also a prominent supporter of the Dog For Dog charity, which donates pet food to animal shelters. If you have any information which could help the RSPCA investigation, leave a message on the inspector’s appeal line number on 0300 123 8018.